It's time to get our calendars synced for March Magics! I've chosen dates for the two readalongs and have scheduled Twitter party dates so that we can get together and celebrate Terry and Diana and share the love with the whole Twitterverse. I'm also throwing out some prompts for Tuesdays and Thursdays just to keep the conversation going. Feel free to post about as few or as many of them as you want. On March 1st I'll put up a pinned post so that you can come back and share the links to anything you write/draw/etc. during the month. Tuesday, March 1 - Share your books! Show us your own DWJ/Pratchett books and/or the books that you are planning on reading this month. There are A LOT of characters to choose from but is there one that stands out as a favorite? I'll post some questions and just start some general discussion. 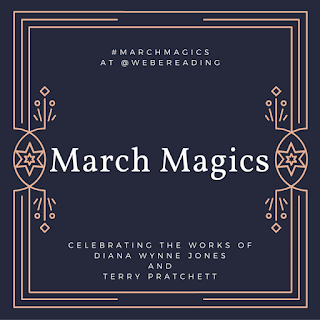 Use #marchmagics and #terrypratchett to post any lovely memory, quote, art, etc. that you want. This one might be tough to narrow down but also a lot of fun! Fantasy book covers can sometimes be, well, interesting. Share your favorite bad DWJ or Pratchett covers! Again, I'll post some questions and just start some general discussion. 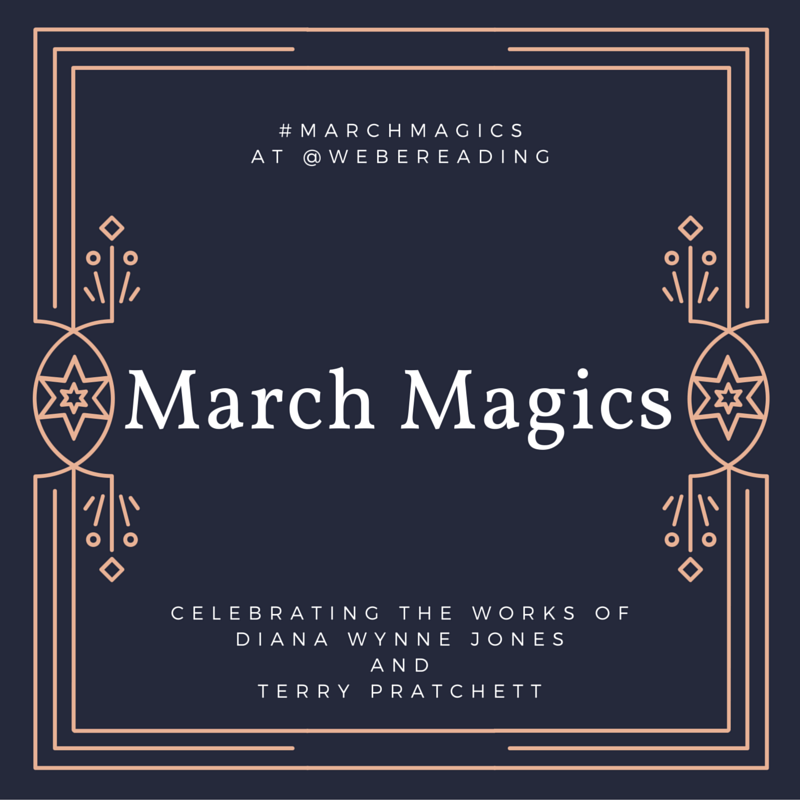 Use #marchmagics and #dianawynnejones to post any lovely memory, quote, art, etc. that you want. Which two characters need to be together -- bonus points for crossovers between authors! For the rest of the month, I would love to see book reviews, fan fiction, art, and anything else you can think of. 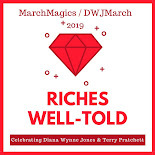 This event isn't about following any formula, it's just about having fun, reading our favorite authors, and bringing new readers into the DWJ/Pratchett fold. So, if you want to host a giveaway or an extra readalong or anything else, please do! Just tell me about it and I'll spread the word. I look forward to spending March with all of you and with my good friends Diana and Terry, whom I miss dearly. Oh wow! So much fun. I'm going to have to write posts for weeks ahead of time! I'm getting going on the posts too! Some of them are harder to make a decision on than I thought they would be! Love these topics! I especially look forward to sharing my favorite bad cover art. Awwwww, Dark Lord of Derkholm! Excellent choice for a readalong! I was just rereading Year of the Griffin, so I'm probably due a Derkholm read pretty soon. An all-day Terry Pratchett Twitter party is pretty much the best thing I have heard! Can't wait for March. I'm so glad you're joining in this year! I definitely need to be in on this. I definitely want you to join us! I hadn't read Pratchett until just a couple of years ago so it's never late to give him a try! For Pratchett, I recommend The Colour of Magic or Equal Rites if you like fantasy, or Dodger if you like historical fiction. For Jones, I recommend Howl's Moving Castle, Charmed Life, or Enchanted Glass. I envy you reading some of these books for the first time! I'm in! Can't wait to start. Me too! So glad to have you along for the fun! I am very new to both DWJ and TP so I don't really have any concrete list of books to read. However, I hope to read both Fire and Hemlock and The Color of Magic. Both very good choices! I will be reading a couple that are further down the storyline from The Color of Magic. There are some great characters in there! I usually read so much DWJ during the month of March. I definitely think Pratchett's books are a perfect complement so I'm excited to add them this year!